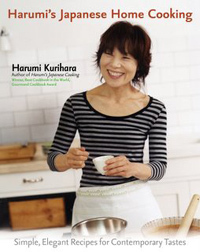 For Christmas, I received a copy of Harumi Kurihara’s Japanese Home Cooking . 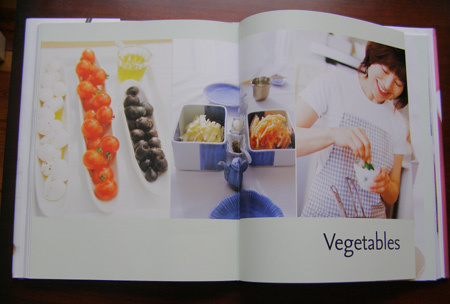 Kurihara has been dubbed the Japanese Martha Stewart (no doubt by her publishers), and this book, with its bright images & chic layout, definitely has Stewart’s flair. Kurihara is more immediately endearing, however. Chatting with her over a beer doesn’t seem impossible, as it does with Stewart. You can also see why Kurihara’s fans look up to her while simultaneously identifying with her: she’s a 60-something woman who looks two decades younger, and in her own words, is “not too beautiful.” She learned cooking as a housewife, but has a perfectionist streak. While her recipes are practical and built for speed, she still suggests making your own sauces & noodles. Convenience isn’t king, domesticity isn’t a burden. If anything, Kurihara makes it look easy & fun. Some of it is great. I’ve made the teriyaki chicken twice now, and both times everyone loved it. The sweet egg roll was tasty. Her recipes are elegantly simple & straightforward, and I like that she reuses many of the same ingredients without losing variety. On those strengths alone, I recommend the book. Half of what I’ve made, though, fell short. The miso soup worked once, then flopped. The sesame dressing felt heavy. The ginger pork was delicious, but the accompanying salad dressing only so-so. 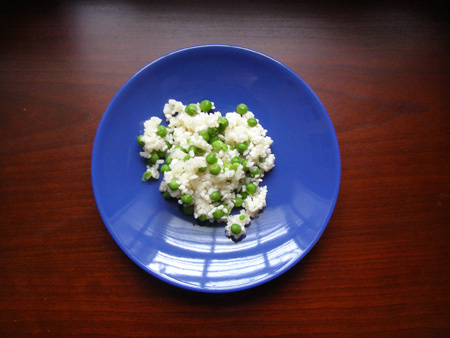 The rice with peas (below) was terrible. Half of it was gooey, the other half crunchy, and I still don’t know what happened. 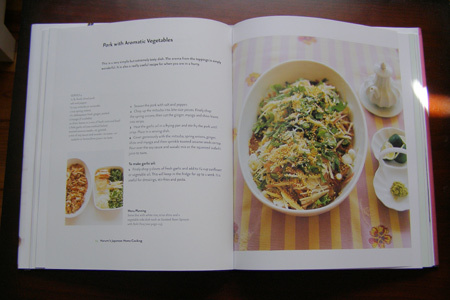 Another issue may be personal: no cookbook can match a user’s tastebuds exactly, and I may have started off with the wrong recipes. For example, the miso soup uses a bonito flake dashi, and I think I prefer kombu or another kind of vegetarian dashi. I’ll try more recipes and post an update to this point later. Finally, a more general difficulty may be the ingredients. You’ll need a specialty grocer, mainly for non-perishables like mirin, chili oil, & shichimi togarashi. Even then, you’ll have to improvise (e.g., several recipes call for Chinese soup paste, which I can’t find). Plus, the ingredients you do find may not be the right ones; while Kurihara provides notes for foreign ingredients, they aren’t extensive and she leaves out basics like mirin & soy sauce. I understand why she would; that said, many Americans have never used mirin, and some don’t know the difference between Kikkoman & La Choy soy sauces. If users don’t already have some grasp of Japanese cooking (and some knowledge of what things are supposed to taste like), they’ll find themselves veering further and further away from the intended product without even realizing it. With cookbooks like this one, where pared down dishes emphasize the combination of a few key flavors, that’s extra problematic. Verdict: Presentation & personality distinguish Harumi’s Japanese Home Cooking , and while the recipes aren’t fool-proof, they’re still worth trying. Just adhere to the instructions & avoid substituting ingredients when possible (and have a backup plan if that fails). Read more about Kurihara at The New York Times, East West, SantaFeNewMexican.com, & BNET. Did you try her white chocolate cake recipe?? Any tips? I haven’t! The cake’s beautiful, but white chocolate’s not my thing (I love dark, myself). Have you tried it? I just made the white chocolate cake from Harumi’s Japanese Home cooking. The recipe doesn’t work as published. doesn’t even make enough batter to cover the bottom of the pan. super dry and heavy. maybe separating the eggs before beating would work better or perhaps some leaving agent, e.g. baking powder would help.